The Story Of Windows 7 & Server 2008 End Of Life Has Just Gone Viral! Microsoft's most loved computing operating systems are ending sooner than we think. Support for Windows 7, Windows Server 2008 and Windows Server 2008 R2 end on January 14th, 2020. This means that they will discontinue all support, including paid support; and all updates, including security updates. At this time your systems will no longer receive regular security updates, it is because of this that your older systems will no longer be considered compliant. Additionally, your computers, servers, medical modalities running these older systems will be prone to new unpatched exploits, potentially leaving your systems open to further attacks. 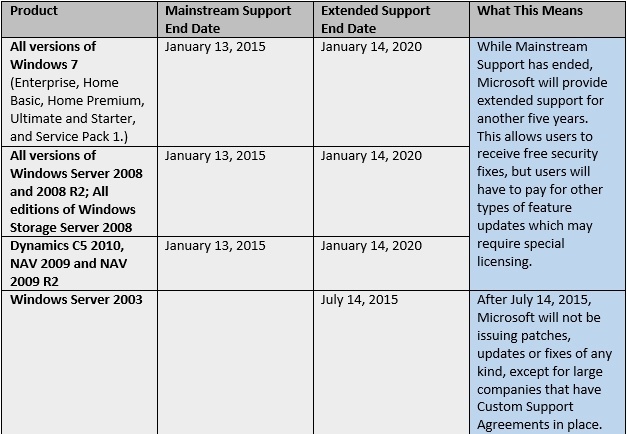 Between now and January 2020, Microsoft is offering "extended support" for Windows 7. Which means, Microsoft is still offering paid support and continues to provide security updates. No new features will be released. As for Windows Server 2008, everyone will need to migrate to Windows Server 2012 or higher. Microsoft will no longer accept warranty claims, or provide non-security hot fixes. Microsoft will continue to offer bug fixes and security updates through extended support. Be mindful though, that we must validate what systems are being supported by your line of business and your applications before proposing an upgrade solution, it is not uncommon for software vendors (including many EMRs) to not support the most recent Server operating systems. 1. Identify devices that need to be upgraded or replaced that meet essential (HIPAA) security compliance. 2. Develop a budget for upgrades, replacements and a timeline of when this will occur. 3. If your systems needing upgrades aren’t powerful enough for the latest Microsoft upgrades, we recommend backing up valuable data and then shredding the hard drive, recycling the old PC, and replacing it with a new computer running Windows 8 Professional or Windows 10. 4. Have security controls in place to separate difficult systems from Windows 7 and Server 2008 machines that cannot be upgraded or removed. 5. Training employees on the new upcoming operating systems that are going to be implemented in your practice/business. What is Windows 10 and how do I upgrade From Windows 7? The great thing about Windows 10 is that it supports apps that are used across multiple devices, including PCs, tablets, and smartphones. It supports face login, touchscreen, and keyboard/mouse input methods and is faster than Windows 7. It has a lot of useful benefits like interface, security, speed, compatibility, and software tools that are a massive improvement over Windows 7. The goal of Windows 10 is familiarity and a much simpler learning curve. It gives you the best of both worlds. Is your practice/business still using Windows 7 and Server 2008? Do you need help upgrading your operating system, replacing your computers with Windows 10 and Server 2012, hard drive shredding and recycling? We're always here to help with all of your IT needs.